Fyodor Lukyanov talks about what Russia gained from the collapse of the Soviet Union and why it makes no sense to look back and try to find reference points in the Soviet past. Sunday, December 30, 2012 marks the 90th anniversary of the formation of the Union of Soviet Socialist Republics (U.S.S.R.) – the state which is still the birthplace of more than fourth-fifths of Russian citizens (the rest were born in sovereign Russia). The Soviet Union was one year short of seventy when it collapsed, yet the causes and consequences of the demise of the superpower are still hotly debated. The dissolution of the Union on December 25, 1991 was a surprisingly low-key affair. A Western diplomat recalled that, when he came to Red Square on the evening of Mikhail Gorbachev’s abdication, he was struck by how deserted it was. Only a Japanese camera crew was braving the chilly winds, hoping to record something historic. There were no crowds either hailing the fall of an empire or protesting against the dissolution of their country. Society was weary of the protracted death throes of the Soviet state, which had really ended five months earlier, in August. The fact that a formal line was drawn under the Soviet era brought a sense of relief and hope for the dawn of a new epoch. However, as the date of the break-up of the Soviet Union receded into the past, the arguments about it grew fiercer. The awareness that there was no return came slowly and, initially, few people believed that an independent Ukraine or a sovereign Kyrgyzstan would survive for long. The Russian attitude toward the events of December 1991 is a striking contrast to the perception in the other former Soviet republics. In general, the collapse of the united country benefited only a minority, but in other republics they celebrated gains and did not bemoan losses; they marked the acquisition of their own statehood, which, for all its faults, is perceived as a precious thing. Russian society is still not sure whether our present statehood is full-fledged or a fragment of another, “real” country. Practically the entire Russian discourse about the past and future is informed by grief – passive and depressive, mainly rhetorical, and sometimes propagandist. This is still the case, in spite of the fact that the real agenda has nothing to do with the Soviet past. People are basically forward-looking, but they keep looking back, seeking to find some reference points in the Soviet past. But this is to no avail – all things Soviet have been exhausted in the political, economic, ideological and moral sense. There is nothing more to restore: one has to create something new. We like to catalog what Russia lost with the collapse of the Soviet Union. But what has it gained? Gain is the flip side of loss. Russia lost its superpower status that it did not have until the mid-20th century and, I would hazard to say, will not have ever again. The geopolitical position as one of the world’s two main countries and the influence that reached every corner of the world were the results of a unique set of circumstances that will never happen again. Before long, the notion of “superpower” as it was used during the Cold War will disappear. There is no room for that notion in a multipolar world. Russia has lost part of its territory to which it considered (and still considers) itself to be entitled. That wound is difficult to heal, although time heals all. When the Crimea or Odessa are mentioned today, the pitch of nostalgia is not as high as before. In exchange, Russia obtained greater freedom (meaning the state as a political actor; the question of what freedom its citizens gained and how they have used it merits a separate discussion): this is the freedom not to take part in all the international processes; to evade what is not of primary importance; not to be bound by a great mission, ideological dogma or the need to constantly prove its extraordinary prowess. For a long time this was not seen as an advantage. Indeed, the political elite and much of society were pining for such a global role. It is only now that it is becoming clear that, in a world where anyone claiming absolute power automatically becomes responsible for events beyond his control, not having to play such a role may be a boon. The “Arab Spring” raging in the Middle East is a ready illustration. If Russia had the status and international obligations of the Soviet Union, it would have had to interfere actively to steer events in a certain direction, in order not to lose its leading role. This is what the United States is doing today, with a dubious, if not actually a counter-productive result. Its wish to be “on the right side of history” led Washington into a de facto alliance with the very forces it had been fighting in the preceding 10 years, which, of course, see it as a tactical and not a strategic ally. As time goes on, it will be ever more difficult and dangerous to clear up the mess in that part of the world. Russia is trying to uphold certain principles there, but “in extremis,” it may simply tiptoe out and concentrate on more pressing needs. This is something the United States simply cannot afford to do. 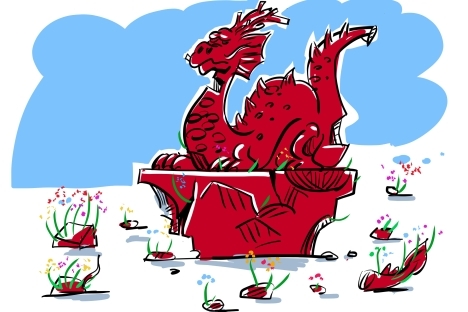 Twenty-one years ago, they slew the dragon and reveled in its triumph so long that they overlooked the fact that they had gradually taken its place. Fyodor Lukyanov is Chairman of the Presidium of the Council on Foreign and Defense Policy. First published in Russian in Rossiyskaya Gazeta.